ClientWise is the premier business and executive coaching and consulting firm working exclusively with financial professionals. We specialize in helping clients optimize growth and maximize revenue by engaging as a knowledgeable partner in accomplishing specific and significant business results. Our full-service coaching programs empower financial advisors, wholesalers, managers and executives to enhance performance through customized, action-oriented solutions based on each client’s specific vision and situation. Drawing from an in-depth knowledge of the financial industry, ClientWise’s mission is to professionally develop industry leaders and consistently raise the bar for industry service. Simply put, our singular focus is to help you get clear, get focused, and get results. As members of the International Coaching Federation (ICF), our coaches adhere to a strict code of ethics and commit to coaching as a joint partnership. Their extensive work with over 1,500 top industry performers and our ClientWise team of researchers allows them unique access to the challenges and opportunities faced by financial professionals. The ClientWise team personally matches each financial professional with a highly trained ICF Coach based on his or her individual goals and preferences. 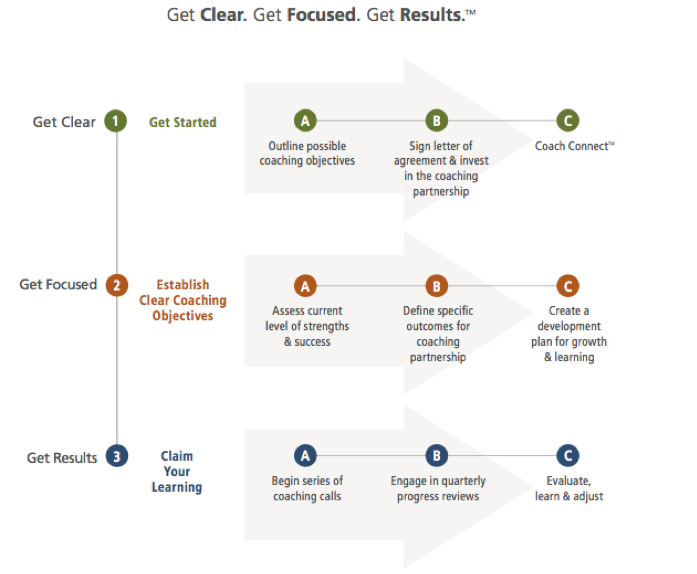 Through a nine-step process, coach and financial professional come to a powerful coaching agreement in which financial professionals play an active role in establishing their coaching objectives and applying these in their practice through frequent check-ins and quarterly progress reviews. Financial professionals get results for their business, learn to replicate these results on their own, and improve their communication with staff, prospective clients, and centers of influence by sustaining the model established by their coaching partnership. This coaching process is coupled with our original ClientWise practice management content, which is developed from in-depth research by industry experts and our own ClientWise research team. Our proprietary tools and databases, including The ClientWise Benchmark Assessment Report ™ and The ClientWise Coach Insights Database ™, contain best practices from leading professionals and access to the most significant financial trends and influences worldwide. As our overarching mission is to generate consistent industry improvement through the growth of individual professionals, we continually tap into our resources to generate the best practice management tools and content with which to fuel that improvement. So when the financial services industry shifts and changes the environment, we have clarity around how to evolve with it. Our proprietary content and coaching tune up programs allow financial professionals the ability to evolve alongside ClientWise throughout the life of their businesses, providing even more opportunities for success moving forward. Our ability to provide sound industry knowledge through the powerful lens of a coaching partnership is unmatched, and this combination solidifies the ClientWise advantage.